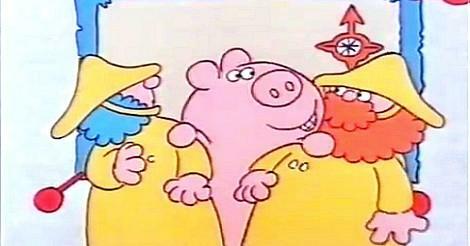 This long-forgotten cartoon series was created by Grange Calveley who also penned the more well-known animation Roobarb. The series was originally aired on BBC1 during 1976 and 1977, although only 15 episodes were ever produced. An old BBC TV listing from August 1980 shows that this series was repeated during the summer holidays at 9.50am. Ah, the summer hols - what happy times they were. Have a lie in, watch a bit of kids TV and then go out and play with your mates with not a care in the world - bliss! As with Roobarb, the main narrator was comedy actor Richard Briers and just hearing his voice again takes me straight back to my 70s childhood. Peter Hawkins provided the voices for each of the animals, and cleverly uses a different voice for each one. Hawkins voiced a diverse range of children's TV series, including Bill And Ben The Flowerpot Men, Captain Pugwash, the Daleks and Cyberman and Zippy in Rainbow (in 1972), to name but a few. The storyline revolved around the adventures of Captain Nutty Noah and his wife, Nelly. The plot was quite similar in each episode and was based on the biblical story of Noah's Ark, although pretty loosely, I must say. Sometimes, near the start of the cartoon, the Captain pointed to a new place to explore using his map. The map was actually blank so it would have been a fat lot of use anyway! 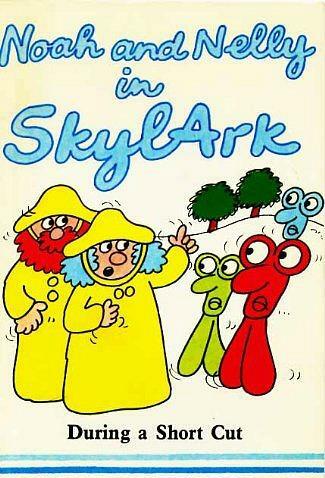 One thing guaranteed in each and every episode was Nutty Noah shouting out "all aboard the SkylArk! ", sometimes using his megaphone. Each animal had two heads (as did the SkylArk), and so instead of boarding two by two as in the bible story, they boarded one by two - have I got that right? Each head had an opposing character. For example, one would be happy and the other sad and they would often disagree with each other - what a great concept! The animals were Humphrey the pigs, Cedric the crocodiles, Maureen the giraffe, Ahmed the camels, Rose the elephants, Cynthia the snakes, George the rhinos, William the hippos, Brian the lions, Cyril the tigers, Mildred the geese and Ronald the gorillas - I think I've got them all? The SkylArk would reach its destination using an array of transportation methods including hot air balloon, wheels, beneath the sea like a submarine and on the sea using a sail. Noah, Nelly and the animals would then discover someone in need of their help. The animals would usually help out, but Nelly would be the ultimate saviour and would knit something to aid them - she could knit just about any object or piece of machinery you could think of. Hmm, more useful than my Gran's baggy jumpers which I never grew into! 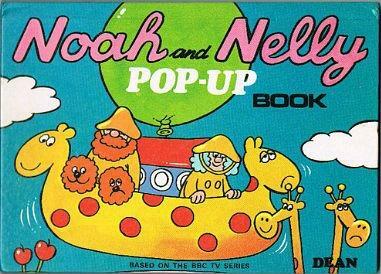 I believe that the Noah and Nelly cartoons have never been shown on TV since 1980, which is puzzling to me as I always enjoyed watching this cartoon and remember discussing it with my friends in the school playground.